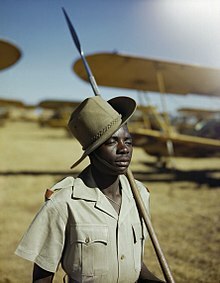 A guard with assegai in South Africa, 1943. From French azagaie (now zagaie) or Portuguese azagaia, Spanish azagaya, from colloquial Arabic اَلزَّغَايَة‎ (az-zaḡāya), from Proto-Berber *zaġāya (“spear”). A slim hardwood spear or javelin with an iron tip, especially those used by Bantu peoples of Southern Africa. My client welcomed the judge […] and they disappeared together into the Ethiopian card-room, which was filled with the assegais and exclamation point shields Mr. Cooke had had made at the sawmill at Beaverton. Native mats covered the clay walls; a collection of spears, assegais, shields, knives was hung up in trophies. A birdchief, bluestreaked and feathered in war panoply with his assegai, striding through a crackling canebrake over beechmast and acorns. Without a word, he took my foreskin, pulled it forward, and then, in a single motion, brought down his assegai. The tree species Curtisia dentata, the wood of which is traditionally used to make assegais. To spear with an assegai.